Google Cloud Platform is a robust infrastructure that provides a secure cloud environment for web applications. It enables companies to run their applications by utilizing the same technologies and tools that Google does. Other than that, businesses can look forward to better infrastructure that lets their developers and coders work faster and scales quickly according to need. With the Google Cloud Platform, startups, SMBs, and enterprises can reduce their IT costs. That is because the solution has a customer-friendly pricing plan. As such, there are no upfront costs, no stifling contracts and termination fees, and businesses pay only for the service they use. App developers need a robust and scalable infrastructure that can manage the heavy loads of thousands of users consuming their apps from all over the world. With Google Cloud Platform, they can easily provide enjoyable experiences to these users as it helps the app, to not just scale, but to do so automatically. There are users that require immense computing power to create. Google Cloud Platform can provide that without taxing valuable resources. With this, companies can offer the best graphics, images, and videos to their clients and to their audiences without sacrificing a pixel or a frame. One of the powerful tools of Google Cloud Platform is its machine learning engine. If companies integrate this to their applications, they are able to tap into a technology that lets them process and analyze flawlessly millions upon millions of data in images, texts, videos, and more. Intuitive applications do not have to be made using expensive resources. If so, it only pressures the company to gain higher and higher ROI overtime. But with Google Cloud Platform, they can regain their investments almost without stress as pricing is usually per-second. That means Google bills the company only for the duration of their usage of a service or a tool. Everything that is put up on or occurs in the Google Cloud Platform is vigorously protected. Google has a network of more than 700 top security experts to ensure that large amounts of sensitive company data are safe against any kind of malicious attack. Organizations have unique wants and requirements and no software application can be perfect in such a scenario. It is pointless to try to find an ideal off-the-shelf software app that fulfills all your business requirements. The intelligent thing to do would be to customize the application for your specific needs, employee skill levels, finances, and other elements. For these reasons, do not hurry and subscribe to well-publicized trendy systems. Though these may be widely used, they may not be the best fit for your specific needs. Do your research, look into each short-listed platform in detail, read a few Google Cloud Platform reviews, contact the seller for clarifications, and finally settle for the application that provides what you need. How Much Does Google Cloud Platform Cost? We realize that when you make a decision to buy IT Security Software it’s important not only to see how experts evaluate it in their reviews, but also to find out if the real people and companies that buy it are actually satisfied with the product. That’s why we’ve created our behavior-based Customer Satisfaction Algorithm™ that gathers customer reviews, comments and Google Cloud Platform reviews across a wide range of social media sites. The data is then presented in an easy to digest form showing how many people had positive and negative experience with Google Cloud Platform. With that information at hand you should be equipped to make an informed buying decision that you won’t regret. What are Google Cloud Platform pricing details? What integrations are available for Google Cloud Platform? 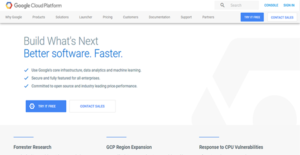 If you need more information about Google Cloud Platform or you simply have a question let us know what you need and we’ll forward your request directly to the vendor.